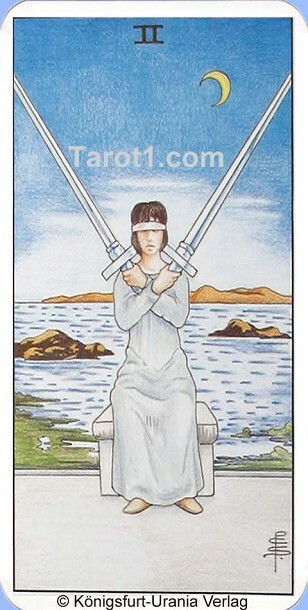 A blindfolded woman is sitting on a bench and she is defensively holding two swords in the air. She is denying access to the sea and the moon. That is meaning that we are blocked by something, we are divided, and we do not see a real solution to our problem. Your relationship is divided and somehow you can not find any longer trust to your partner. For too long time you have not paid attention to your relationship. You did not take care of your partner and on his feelings and desires. Be now tender and attentive to your partner, maybe you still can save the relationship. Today someone will try to take advantage your good faith and try to cheat you. Be attentive today, even if other people talk a situation nicely, research it before you get involved in something. This is especially important for the financial sector! Do not make investments before you know everything about the business.